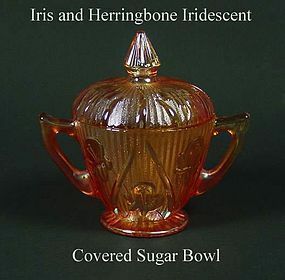 This iridescent Iris and Herringbone sugar bowl and cover was made by the Jeannette Glass Co. in the 1950's. It is in excellent condition! 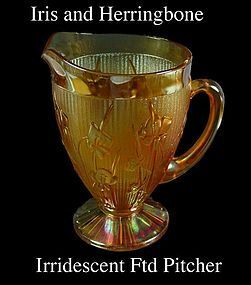 This Iris and Herringbone footed pitcher is in excellent condition! Very strong irridescent finish! 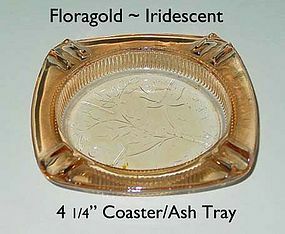 This iridescent Floragold 4 inch coaster/ash tray is in excellent condition! 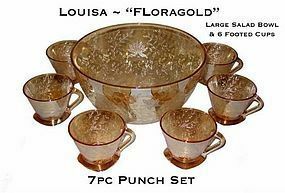 This punch set consists of a 9 1/4" Floragold salad bowl and 6 footed cups. 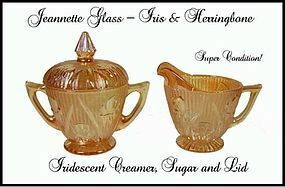 All pieces are in excellent condition! 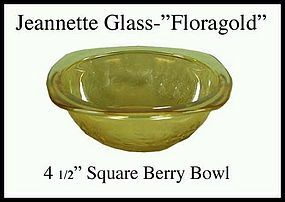 This was produced in the 1950's by The Jeannette Glass Co. 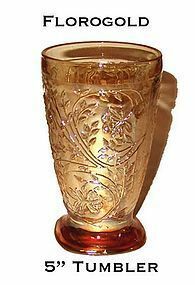 This 10 oz carnival color tumbler in the Floragold pattern was made by The Jeannette Glass Co. in the 1950's. The color looks a little darker in the photo than it is, but there is no damage. They are the true color of Floragold. 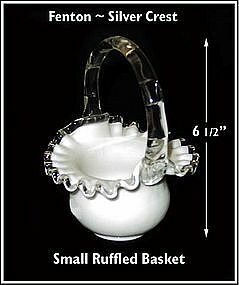 This small Silver Crest basket was made by The Fenton Art Glass Co. and is in excellent condition.